said his port and the Port of Portland are "connected at the hip." 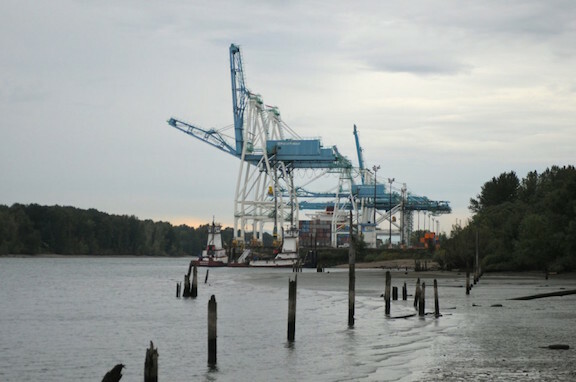 PORTLAND, Ore. (AP) Michael Thorne remembers the Port of Portland's container terminal as a high-maintenance money-loser. The terminal, 102 mi. (164 km) upriver from the ocean, never seriously competed with major West Coast container ports. In 2008, Portland accounted for just 1.3 percent of container movement along the coast, according to the Pacific Maritime Association. "The volatility of the container business line is a major strategic issue for the Port," the report reads. Puget Sound. Doeringsfeld's counterpart in Boardman, Gary Neal, praised the Port's efforts in that regard. The Oregon Shipping Authority, Mannix has said, could consider renegotiating the Port's contract with ICTSI. Mannix also has floated the idea of using public workers at the docks rather than the longshore union, and the idea that the state could even create its own shipping line. "You'd try to write a congressman, or a senator, and everybody kind of said they couldn't get involved. Hopefully they can get somebody back in there soon," Olson said. "We'd love to see it."